Explore Discovery Cove Orlando Florida! 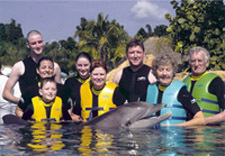 Welcome...to our fantastic family adventures here in Discovery Cove Orlando Florida! Forget the theme parks for a day and chill out in this tropical hideaway with pristine beaches, coral reefs and grottoes...Pure Nirvana. Like thousands before us, experience swimming, snorkelling, diving and bird sanctuaries in your own personal paradise for a day. 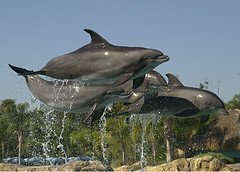 Swim with your own bottlenose dolphin, experience the power and playfulness and watch this incredible creature bring joy to you and your family. Unforgettable memories will remain with you for the rest of your life. We promise if you have the chance to come back to Orlando and it fits into your budget, you will return to Discovery Cove. No matter what time of year you go, high season or low season, the maximum amount of people allowed into Discovery Cove is 1000 at any one time, and we can reassure you a 1000 people in this park allows every one their own personal space to explore and discover this piece of paradise. All packages include a light continental breakfast, lunch, snacks and drinks throughout the day. Also included in the Choice of Adventure packages is 14 consecutive days admission to SeaWorld or Busch Gardens. The Discovery Ultimate Adventure package, includes admission to SeaWorld, Aquatica and Busch Gardens. Click here for details. 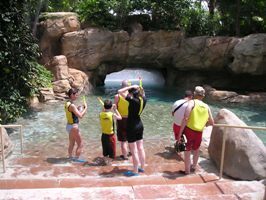 Discovery Cove is not cheap on the admission prices, so if you have this down on your places to visit, plan well in advance and watch the currency rates in your own country compared with the dollar. We booked online direct with the Discovery website 9 months before, and had a great deal. Here's a few helpful links below for information regarding your visit to Discovery Cove. Park Information supplied courtesy of www.discoverycove.com. Road maps/Directions to find Discovery Cove...Car Parking is free. Opening times at the park. Choose your experience...The choice is yours...We did and loved it. Take a tour...Download Map (PDF) if required. 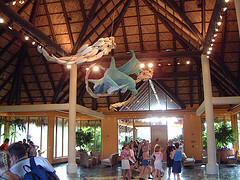 Attractions...What to do in Discovery Cove. Dining...Choose from a wide range of snacks including Steaks, Lobster, Jamalaya, Burgers, Chicken, Salads and a wide selection of sweets. Continental breakfast is availble for the early birds. Speciality Occasions...Private areas for birthdays, anniversaries etc. Email Sign-Up...Keep updated through out the year from the comfort of your own home! Forums...Peoples views and experiences about the Pirates Dinner Show and around Orlando just choose a number 1, 2, 3, 4. When you park your vehicle which again is free, make your way to the main entrance of Discovery Cove. When you reach the reception, they will ask for all your names. Photo Id's will be issued to all your party members and you will be designated an area of the park to wind down for the day (Starfish Cabana, Sea Horse Cabana, Sand Dollar Cabana). You will be told the time of your Dolphin swim if you have taken that option..
Once you leave the reception area, complimentary hot drinks are available. Also you will be approached by a photographer for your group pictures...don't forget your park map which will give directions over to the wet suit and locker areas (a large selection of suits are available from children to adults). Do not cover your self or children with suntan lotion before you reach the park. The staff will hand you fish friendly sun tan cream on your arrival, and it's very good. Don't forget your under water cameras and beach shoes for the kids, as the sand and the lagoon's can be harsh on those tender feet. Now this is the beauty of Discovery Cove, "Do what you want and when you want to do it"...but remember if you have chosen the Dolphin swim keep to your time allocated to you on your tickets. If you decide to take the Dolphin swim, lots of photos are taken along with a video of your party. You will be asked to view your photos to pick which ones you decide on..so remember budget to your needs as they can take a large chunk of your holiday money. There is no need to rush here and there in Discovery Cove...with only a 1000 visitors allowed at any one time stroll, drift away, snorkel, swim and laze about to your leisure. Because we booked up well in advance, we had the luxury of an early swim time which cleared the rest of the day for all the family to do as we pleased and explore this wonderful park. During our visit, I surprised my darling wife with some thing special; it was our 21st wedding anniversary, so I pre-booked on the quiet, one of the speciality occasion packages. This entitled us our own personal area over looking the Dolphin lagoon with a cabana, champagne, and presents, 'talk about paradise'. It was a special time with all our loved ones, and one we will not forget...Fantastic Memories. Also, an extra special treat was a surprise on the Dolphin swim for Denise, and to complete it all an anniversary cake was presented to us during our excellent lunch. The kids loved Discovery Cove and apart from lunch together, they did their own thing 'like staying in the water all day swimming and snorkelling'. Here they are getting ready for another adventure over-seen by Grandad with video camera at the ready. So if you want to visit this piece of heaven in Orlando, we highly recommend you go, even if you miss a theme park out you will not be disappointed. But hey look on the bright side, for a small amount of extra Dollars, you also receive tickets to SeaWorld, Busch Gardens and Aquatica. We will keep updating this page via our RSS feed. regarding new additions, changes etc, so click onto the RSS feed above and follow the instructions to keep you on top off what's happening in and around Orlando, including Discovery Cove.